Compared with many lands, England has a comparative wealth of early cartographic material. This map was probably created at Canterbury between 1025 and 1050, but is probably ultimately based on a model dating from Roman times. 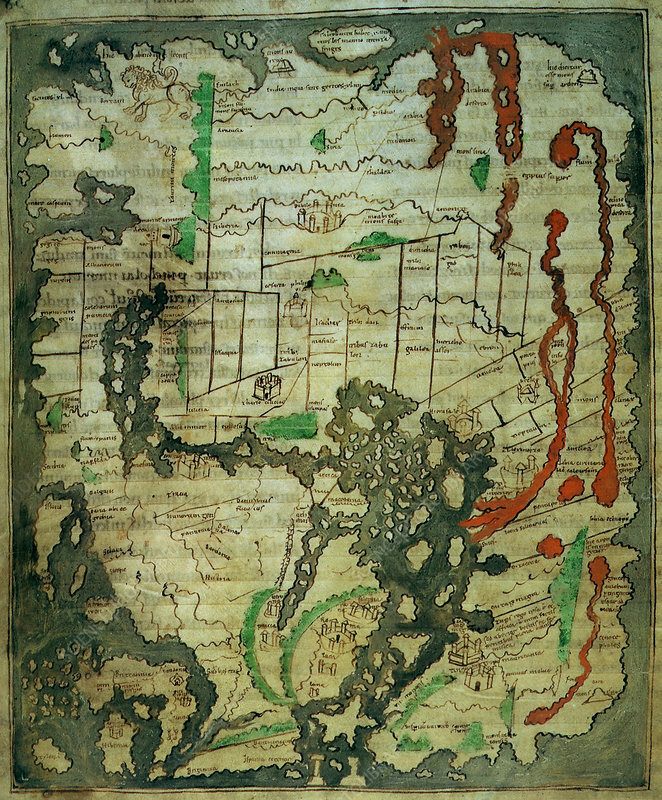 It contains the earliest known, relatively realistic depiction of the British Isles, seen in the bottom left hand corner of this map. Like most early maps, this one has East at the top, nevertheless the British Isles is immediately recognizable, as are the surrounding islands (the Orkneys, Scillies, Channel Islands and the Isles of Man and Wight). The Cornish peninsula is exaggerated, but perhaps most interesting are the two fighting figures which may represent the conflict between the Saxons and the native Britons in the centuries following the departure of the Romans.